Long QT Syndrome (LQTS) is a condition involving the electrical activity of the heart. In a normal heart, an electrical impulse is generated from an electrical center (sinoatrial node). This impulse travels throughout the heart’s wiring system and muscles resulting in contraction of the heart. The timing of the signals allow different chambers of the heart to fill and contract accordingly, thus successfully pumping blood throughout the body. An electrocardiogram (EKG) measures and records the electrical action of the heart. It is displayed as 5 distinct waves: P, Q, R, S, and T. The QT interval is the duration between the Q and T wave. This interval measures the time between the contraction and relaxation period of the two bottom chambers (ventricles). The timing of this and other intervals is critical to the effectiveness of the heart. LQTS occurs when the QT interval is too long. It is typically caused by abnormalities in the heart’s electrical system rather than the cellular structure. The prolongation of the QT interval can cause a fast and chaotic heart rhythm (arrhythmia). Arrhythmias do not allow the heart to pump effectively and can progress to a fainting spell, cardiac arrest, or even sudden death. LQTS can be inherited (genetic) or acquired through certain medications, electrolyte abnormalities, or medical conditions. Your sports medicine physician will review the medical and family history as well as any medications you are currently taking as both can be potential causes. A physical exam will likely include a focus on abnormalities within the heart, lungs, and the neurovascular system. The history and physical exam can help to rule out other important conditions or diseases. An EKG is ordered to analyze the heart’s electrical activity. The QT interval will be identified and calculated since gender and heart rate influence the normal duration of the QT interval. Blood may need to be drawn and evaluated for any abnormalities. Occasionally, your doctor may decide to order a holter monitor, which is a portable EKG that records the heart’s activity throughout your daily activities, to look for an arrhythmia. Patients may need to be referred to a cardiologist for further evaluation and genetic testing. There are a multitude of treatments for LQTS as patients can fall anywhere along the spectrum of disease severity. 4. Acquire an internal cardiac defibrillator, if necessary for certain people. 5. Establish an emergency action plan with team, coaching staff, and medical personnel. 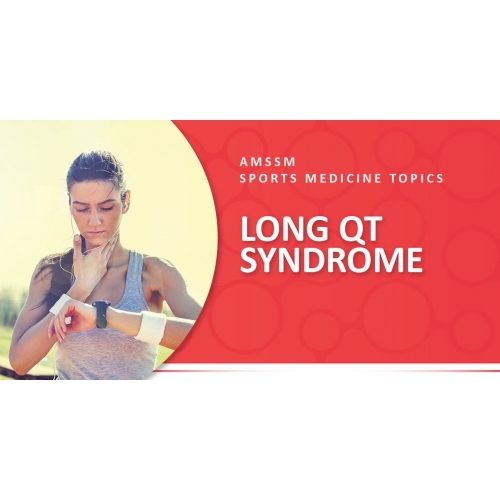 Traditionally, athletes with Long QT syndrome were restricted from all competitive sports according to 2005 guideline-based recommendations. However, in 2015, the American Heart Association released new recommendations regarding return to play. These are based on new developments in genetic testing and observational evidence showing good outcomes in athletes with diagnosed LQTS who have returned to competitive sports. The new guidelines recommend a return to play decision for athletes suspected of having a cardiac abnormality only take place after evaluation, risk stratification, treatment, and counselling by a heart rhythm specialist or genetic cardiologist with sufficient experience in LQTS. 1. Ackerman, Michael J., Douglas P. Zipes, Richard J. Kovacs, and Barry J. Maron. AHA/ACC Scientific Statement: Eligibility and Disqualification Recommendations for Competitive Athletes With Cardiovascular Abnormalities: Task Force 10: The Cardiac Channelopathies. Circulation. 2015;132:e326-e329. 2. Hunter, John D., Prashast Sharma, and Sarika Rathi. Long QT syndrome. Continuing Education in Anaesthesia Critical Care & Pain. 2008;8(2):67–70. 3. Nachimuthu S, Assar MD, Schussler JM. Drug-induced QT interval prolongation: mechanisms and clinical management. Therapeutic Advances in Drug Safety. 2012;3(5):241-253. 4. Schwartz, Peter J., Lia Crotti, Roberto Insolia. Long-QT Syndrome: From Genetics to Management. Circulation: Arrhythmia and Electrophysiology. 2012;5:868-877.